Eternal Orthodox Church calendar for the 20.06 year 2017. This martyr was a secret Christian and, as such, used to help the Church and give burial to the bodies of the martyrs. He buried the bodies of seven young maidens who had suffered for Christ. When the pagans discovered this, they attacked him and he was killed (see May 18th for more about him). All three of these martyrs was from Caesarea in Palestine. When a persecution of Christians arose, they withdrew from the city to a hut, where they prayed unceasingly to God with fasting and tears that the Christian faith might be spread throughout the entire world and that persecution might cease. As the result of slander, they were brought to trial and tortured, and died under their torments in the year 304. And so these glorious virgins were crowned with the wreath of martyrdom. In the reign of the Emperor Maximian, Marcellus was condemned to keep cattle in a certain place. In order to please Diocletian, who had taken him as co-Emperor, Maximian began to build the Thermae, the baths in Rome, and forced the Christians to work on them as Pharaoh had once forced the Jews in Egypt. Many Christians perished there. 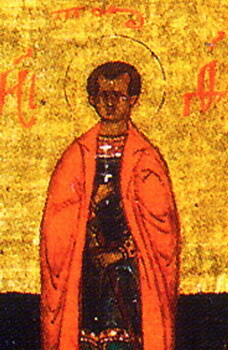 The deacon Kyriakus, who had healed Artemia, Diocietian"s daughter, of an evil spirit (for he had great power over demons), suffered at this time. He had also healed Jovia, the daughter of the Persian king, and had baptised them both. Artemia, the deacon Sisinius, two friends of Kyriakus, Smaragdus and Largius, the deacon Aphronianus and two newly baptised Roman soldiers, Papius and Maurus, the elder Saturninus and Crescentianus, the blessed maidens Priscilla and Lucina, who used their great wealth to have graves made for the Christian martyrs - all these suffered at this time. The holy Pope Marcellus cared for the cattle for a long time, but finally became weakened from hunger and humiliation and the tortures of the soldiers, and surrendered his soul to God. Marcellinus was Pope Marcellus"s predecessor on the Roman throne. When the Emperor Diocletian summoned him and threatened him with torture, he offered sacrifice to idols and was, because of this, rewarded by the Emperor with a costly garment. But Marcellinus repented bitterly and began to weep both day and night for his rejection of Christ, even as the Apostle Peter had before him. A synod of bishops was held at that time in Campania, and the Pope dressed himself in sackcloth and sprinkled ashes on his head, and, going before the Synod, confessed his sin and asked them to judge him. The fathers said: "Let him judge himself." Then he said: "I strip myself of the sacerdotal rank of which I am not worthy; and, further, let my body not be buried after my death, but let it be thrown to the dogs." Having said this, he pronounced a curse on any who should dare to bury him. He then went to the Emperor Diocletian and, casting the precious garment in front of him, confessed his faith in Christ and cursed the idols. The enraged Emperor ordered that he be tortured and killed outside the city, together with three other men: Claudius, Cyrinus and Antoninus. The bodies of these three were buried at once, but the Pope"s body lay there for thirty-six days. Then St Peter appeared to Marcellus, the new Pope, and told him to bury Marcellinus"s body, saying: "Who so humbleth himself shall be exalted." 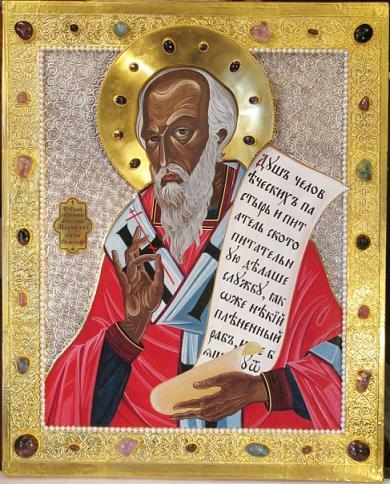 The abbot of the famous Scetis in Egypt, he was a disciple of St Arsenius and a teacher of many. Many of his words and teachings are like celestial signposts for monks. Once, when the barbarians were attacking Scetis, the brethren called to him to flee with them, but he replied: "If God does not care for me, what reason is there for me to live?" He also once said: "Insofar as your body grows fat, even so does your soul wither away." He lived the communal life as an ascetic for forty years, and then in the year 420 took himself off to the desert. He happened to be in Alexandria when an evil man murdered his son"s wife because of her chastity. This was St Thomais (see April 13th), and he buried the martyr with the help of his disciples. 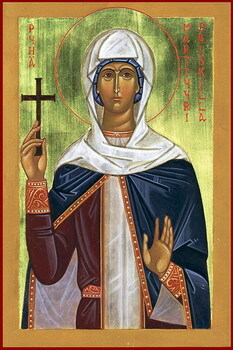 The Holy Women Hesia and Susanna were disciples of the PriestMartyr Pankratios, Bishop of Tauromeneia (Comm. 9 July), a disciple of the Apostle Peter.